Met 16–bit resolutie, low noise en low distortion, heeft de PicoScope 4262 de preciezie en eigenschappen die u nodig heeft. The PicoScope 4262 is a dual–channel, 16–bit very–high–resolution oscilloscope (VHRO) with an integrated low–distortion signal generator. With its 5 MHz bandwidth, it can easily analyse audio, ultrasonic and vibration signals, characterise noise in switched mode power supplies, measure distortion and perform a wide range of precision measurement tasks. The PicoScope 4262 includes an integrated low–distortion signal generator. As well as basic controls to set level, offset and frequency, more advanced controls allow you to sweep over a range of frequencies. Combined with the spectrum peak hold option, this makes the PicoScope 4262 a powerful tool for testing amplifier and filter responses. The PicoScope 4262 also includes a programmable arbitrary waveform generator with a 4,096 sample buffer. 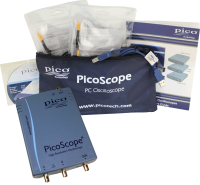 Thanks to the power of the supplied PicoScope software you can also use the PicoScope 4262 as a spectrum analyzer. 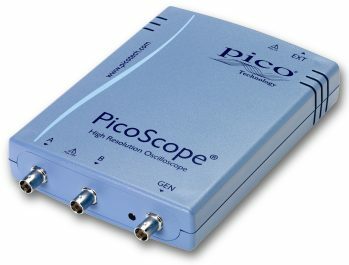 When used as a spectrum analyzer, PicoScope provides 11 automated measurements such as IMD, THD and SFDR that makes it easier and faster for you to accomplish your task. The performance of the PicoScope 4262 when used as a spectrum analyzer is so good that it rivals many dedicated audio analyzers and dynamic signal analyzers costing several times the price. Most digital oscilloscopes have been designed for viewing fast digital signals. The trend has been to use new technology solely to increase sampling rate and bandwidth. With the PicoScope 4262 we have focused on what’s important for measuring analogue signals: increasing the resolution, improving dynamic range, and reducing noise and distortion. At Pico we don’t do “optional extras”. Other companies may think that you should pay for high–end features such as mask limit testing, serial decoding, advanced triggering, automatic measurements, math channels, XY mode, digital filtering and segmented memory. We don’t. When you buy a PicoScope Very–High–Resolution Oscilloscope everything is included in the price. The PicoScope 4262 is a full–featured oscilloscope that can also be used as a high–performance spectrum anazlyer, signal generator and arbitrary waveform generator. With two channels, 16–bit resolution, 10 MS/s sampling, 16 MS buffer memory and 5 MHz bandwidth the PicoScope 4262 gives you the precision and performance you need at a price you can afford.